Complex problems, those that consist of several components, require a slightly different approach. Divide and Conquer is a variation of the equation “Y” is a function of X.” Or simply stated, there could be multiple concepts that make up the topic “Y.” This methodology is also similar to a fishbone (Ishikawa) diagram. The Divide and Conquer concept is easily adapted to problems like on-time delivery and customer satisfaction. These two measurable, yet multi-faceted concepts can be divided into several categories as shown here. 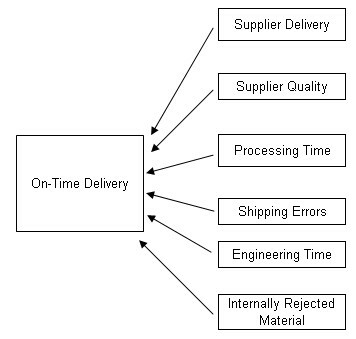 On-time delivery is composed of several other measurable processes, all of which contribute in varying degrees to your organization’s ability to deliver to the customer per their requirements. Engineering time, internal rejects, material rejected at incoming inspection, and processing time are just a few of the many categories that combine to make your company able to deliver on time. This is how divide and conquer works! You start with the overall problem, and then see if you can break it down into smaller parts. After all, trying to correct On-time Delivery as a problem would be very difficult. The team conducts some research into the six factors they identified as contributing to poor delivery. 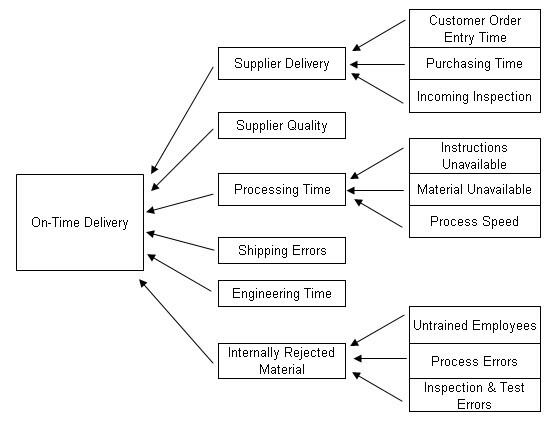 The second investigation showed that Engineering Time and Shipping Errors were not important factors for poor delivery. The team also realized that Supplier Quality was not an issue. The team would concentrate their efforts on Supplier Delivery, Processing Time, and Internally Rejected Material. The team determined that their company may be playing a role in unacceptable supplier delivery performance. They looked at the purchasing process and determined that there are three internal factors potentially able to influence Supplier Delivery. The team again used the same divide and conquer methodology to break apart the factors of Processing Time and Internally Rejected Material. 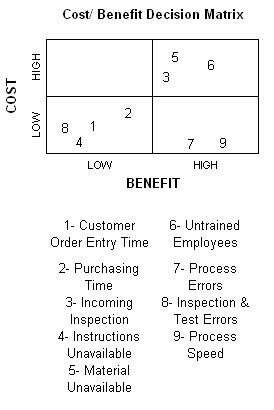 Using a decision matrix, the team determined the best allocation of resources would be to improve the Process Speed, and reduce Process Errors (as shown).A decision matrix is a tool for prioritizing efforts. In this case, the team compared cost to benefit in the matrix and arrived at the two factors that would most likely improve On-Time Delivery.